This year’s Amsterdam Symposium on the History of Food was dedicated to The material culture of cooking tools and techniques and was full of fascinating stuff. 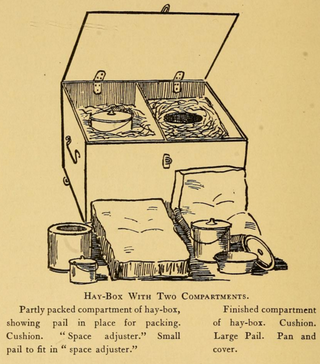 I especially enjoyed a talk on the hay box, the original slow cooker. The principle is simplicity itself. Bring a pot full of food to the boil and then insulate it really well so that it cools down very slowly. The food continues to cook as it cools down and if your insulation is good enough you can come back hours later to find a hot, properly cooked meal. The haybox actually has quite a long history, with three Gold Medals awarded to a Mr Johan Sörensen at the Paris Exhibition in 1867. Various patents were granted to Sörensen and others, and the idea was promoted for “fishermen, pilots, and others whose small vessels are not generally so constructed as to enable them to procure hot food while at sea” and, eventually, domestic cooks. In his talk, Jon Verriet traced the ups and downs of the haybox from around 1895 to the present day. It was most popular in times of war, but always with a moral element to it, even if the moral lesson shifted slightly. There’s a terrific account of The Self-acting Norwegian Cooking Apparatus in the New York Medical Journal, vol 10 (1870). Do not be distracted by either the preceding item (The Effects of Hashish) or the one after (When to Trephine). Thanks to Hedon for the link. The most recent incarnation of the haybox is the Wonderbag, created by a development worker after a restless night and now offering to save the planet and pull people out of poverty. Aside from that, most of the online writing about the haybox is survivalist stuff. I’m not linking to that. The banner image is from Ford Madox Brown’s The Hayfield. I’d like to think that his supper is under one of the little haystacks. The cover illustration is from The Fireless Cook Book, by Margaret J. Mitchell.